The gods and goddesses we will be referring to herein are, in fact, only vaguely related to the Creator God (possibly as interesting results of random walk exercises on the latter's part), and instead, these lower case deities are more akin to mythological gods and goddesses. However, myth and legend are not necessarily fantasy or purely fictional. In fact, it must be emphasized that we will be assuming herein that all such, so-called mythological gods and goddesses are based on real historical individuals who for the most part are extraterrestrials, and who also, in comparison to human beings at least, have a really astounding technological bag of tricks. Furthermore, to some extent the gods and goddesses have a longer evolutionary chain whereby they may have developed some relatively impressive personal talents, abilities, and characteristics. The assumption we're making here is essentially a confirmation of the Sumerian annals that describe their gods and goddesses... and the fact these “Anunnaki” (“those who from heaven to earth came”... or “fell”) are in reality not much more than an extended, occasionally dysfunctional family of extraterrestrials who generally liked to lord it over the earthlings. A corollary to this assumption is that certain royal bloodlines and their associated DNA derive from these gods and goddesses, and are therefore fundamentally important in terms of what any of their descendants might hope to achieve in their lifetimes. These assumptions and others like them, are based upon an enormous library of facts, including initially the Sumerian annals of history in which extraterrestrials (aka guardians, watchers, Anunnaki, et al) have taken on the role of gods and goddesses in assuming power over a lesser, technologically (and perhaps otherwise) developed human race. In a nutshell, royal bloodlines are assumed a priori to have the blood of the extraterrestrial (ET) “lords” and “ladies”. It might also be noted in passing that the first five books of the Bible were first committed to writing during the time when the Jews were being held captive in Babylon (c. 600 BCE). Quite possibly, the Torah was the result of certain, normally literate individuals having a bit more time on their hands than normal, and thus being able to fully plagiarize the Sumerian and Babylonian histories. On the one hand, Tiamat is the earliest mommy to whom anyone can trace their ancestry. On the other hand, she may be a mythological creature that is more fantasy than historical... or more symbolic than real (for example, the constant references to "The Sea", "The Primordial Chaos", and so forth). Curiously, the descriptions of Tiamat in either of these venues may still contribute to the overall picture of Generation No. 1’s most notorious character. Clearly, many viable and real interpretations can be had from mythological descriptions, and more mundane [sic] claims can be subject to spin and exaggeration. Gateways to Babylon, in the first venue, assumes a viewpoint of Tiamat as someone you might assume to be, essentially, your average soccer mom, but one who after seeing Dad take it on the chin from the kids, turns against many of her children. (There was also, apparently, a problem with the kids being too noisy.) [The latter is a common problem among the Anunnaki... and curiously, should not be dismissed out of hand. It might actually be important.] The fact that such dysfunctionality exists in a family, may seem vaguely familiar, and thus suggests the possible reality of many so-called mythological claims. Of course, to be fair, we should note that Gateways to Babylon does correctly suggest that what was happening was not so much a simple family squabble, but a shift in power from the matriarchy to the patriarchy (an accomplishment occuring many thousands of years ago. That is to say, what we have here is: "Tiamat, the Dragon Goddess of Chaos and Darkness, [being] battled by Marduk, God of Justice and Light. This might indicate the change from a matriarchal to a patriarchal system that obviously took place." Another venue can be had from Wikipedia, the free encyclopedia [which in comparison to other sources has just astoundingly little, highly speculative imagination], and to which we will freely refer. "In Babylonian mythology [which is derived from the Sumerian version], Tiamat is a goddess who personifies the sea. She is considered the monstrous embodiment of primordial chaos..." [monstrous is a telling remark in that powerful females often come across as monstrous. See, for example, Terry Pratchett’s Monstrous Regiment, which I highly recommend.] "In the Enûma Elish, the Babylonian epic of creation [but which is also based upon the older Sumerian version... with just a little bit of editing to make the Babylonian god Marduk look good], Tiamat gives birth to the first generation of deities. Tiamat was the "shining" personification of salt water who roared and smote in the chaos of original creation. She and Apsu filled the cosmic abyss with the primeval waters. She is 'Ummu-Hubur who formed all things'." On the other hand, do not hesitate to Google Tiamat, and check out some of the images her fans have generated, for example, (1), (2), (3), and perhaps a bit less dramatic, (4). One might also wonder about the story/rhyme of Old Mother Hubbard, the possible inspiration of which goes back several centuries at least (c. 1591). Slicing Tiamat in half, Anu made from her ribs the vault of heaven and earth. Her weeping eyes became the source of the Tigris and the Euphrates. With the approval of the elder deities, he took from Kingu the Tablets of Destiny, installing himself as the head of the Babylonian pantheon. Kingu was captured and later was slain: his red blood mixed with the red clay of the Earth that would make the body of humankind, created to act as the servant of the younger Igigi deities. “It was a common theme in the writings of the Mesopotamians, Canaanites and Hebrews that the foremost accomplishment of their respective deities was the calming of the wild ocean deep.” “In the sixth century BC, when the Israelites were captives of Nebuchadnezzar, the Enûma Elish was a standard recitation at the New Year festivals in Babylon, as it had been for many centuries.” “There was no way that the old Creation epic could have escaped the attention of the Israelites, and they were clearly fascinated by the content. By that time, they were calling their God ‘Jehovah’, having dispensed with the Canaanite names El Elyon and El Shaddai...” “Thus was the biblical Genesis born, as the Israelite priests made their notes of record. There was, however, a distinct difference between the Babylonian epic and the resultant Genesis account, in that the former tells not only of the god Marduk, but of his being one of a pantheon of gods -- a group of deities who (in parallel Canaanite tradition) were the Elohim. No reed had yet formed, no marshland had appeared. In this context, Apsu is considered by Sitchin to be the Sun, while ‘nearest him’ is Mummu (Mercury). “Farther away was Tiamat. She was the ‘monster’ that Marduk later shattered -- the ‘missing planet’ [aka Asteroid Belt, et al]. But in primordial times she was the very first Virgin Mother of the first Divine Trinity. The space between her and Apsu was not void; it was filled with the primordial elements of Apsu and Tiamat. These waters ‘commingled’ and a pair of celestial gods -- planets [Mars and Venus] -- were formed in the space between Apsu and Tiamat. This was followed by ANSHAR and KISHAR (Saturn and Jupiter), and then Uranus (Anu) and Neptune (Ea/Enki), the latter begotten from Anu: “his equal and in his image”. The Babylonian version names it NUDIMMUD. Even Pluto is mentioned (GAGA), who is ANSHAR’s first born, and who is a bit of a roamer (eccentric orbit?). The critical feature of the Enûma Elish, then is the destruction of Tiamat by Sitchin’s “twelfth planet” (who he names NIBIRU, aka Marduk). Allegedly, the oversized moon of Earth’s is thought to have been a part of Tiamat. “provided a firm foundation for priestly pursuits associated with the teachings of Thoth, which had prevailed from the time of Nimrod’s grandson King Raneb, a pharaoh of the second dynasty.” “It was the obligation of the priests to prepare the exotic food for the light-bodies of the pharaohs, while ensuring the purity of a continuing bloodline which progressed through the Dragon Queens of the Grail Succession. “As the generations passed, the ideal of kingship spread through the Mediterranean lands into the Balkans, Black Sea regions and Europe, but for the most part the crucial essence of the old wisdom was lost. This gave rise to dynasties that were not of the true kingly race -- usurping warriors who gained their thrones by the might of the sword [but who may have nonetheless married into the matriarchal line of succession -- for purposes of gaining legitimacy -- and thus spawned offspring who did in fact have the royal essence]. The sacred culture of the ancients was retained, however, in the Messianic line of King David of Judah (c. 1008 BC), whose significance was in his pharaonic heritage, not in his descent from Abraham and the Shemite strain. It was because of this particular Dragon inheritance that Solomon the wise, some eight centuries after Queen Sobeknefru was enabled to recreate the royal temple project in Jerusalem.” Curiously, Count Dracula, known to historians as Vlad III of Wallahia was quite simply, ‘son of Dracul’, and Dracul (Dragon) was a style by which his father was known. In essence Count Dracula was a descendant and protector of the knowledge of the very ancient Imperial and Royal Court of the Dragon. He was also, as they say, lambasted by history revisionists into a vampire. In the Talmud, the Leviathan is mentioned a number of times. One in particular is: “...here are twelve hours in a day. The first three hours God sits and learns the Torah, the second three hours he sits and judges the world. The third three hours God feeds the entire world... the fourth three hour period God plays with the Leviathan as it is written: "the Leviathan which you have created to play with". In the book of Job, both Behemoth and Leviathan are listed alongside a number of other animals that are clearly mundane, such as goats, eagles, and hawks, leading some Christian scholars to surmise that Behemoth and Leviathan may also be mundane creatures. Some propose Leviathan to be a Nile crocodile. Like the Leviathan, the Nile crocodile is aquatic, scaly, and possesses fierce teeth. Job 41:18 states that Leviathan's eyes "are like the eyelids of the morning". Others suggest that the Leviathan is an exaggerated account of a whale. In Job chapter 41 Leviathan is described as breathing fire like a dragon, and none of these suggested animals breathe fire or fit the details of other Bible passages mentioning Leviathan, such as in the book of Psalms, where it is described as having multiple heads ("Thou brakest the heads of leviathan in pieces..." Psalm 74:14). Some Young Earth Creationists have alleged that Leviathan was either a dinosaur, such as Parasaurolophus (despite being a herbivore and a non-aquatic animal), or a giant marine reptile, such as Kronosaurus (despite lacking armor and a serpentine body). Other Young Earth Creationists say that the giant crocodilian, Sarcosuchus, best fits the description in the Bible. Meanwhile the ancient Chinese had a hard and fast rule that only those individual who were born in the year of the Dragon could become emperors. The really good news is that this author was born in the year of the Iron Dragon! Yea. Apsu (or Abzu, from Sumerian ab = water, zu = far) fathered upon Tiamat the Elder deities Lahmu and Lahamu (the "muddy"), a title given to the gatekeepers at the Enki Abzu temple in Eridu. 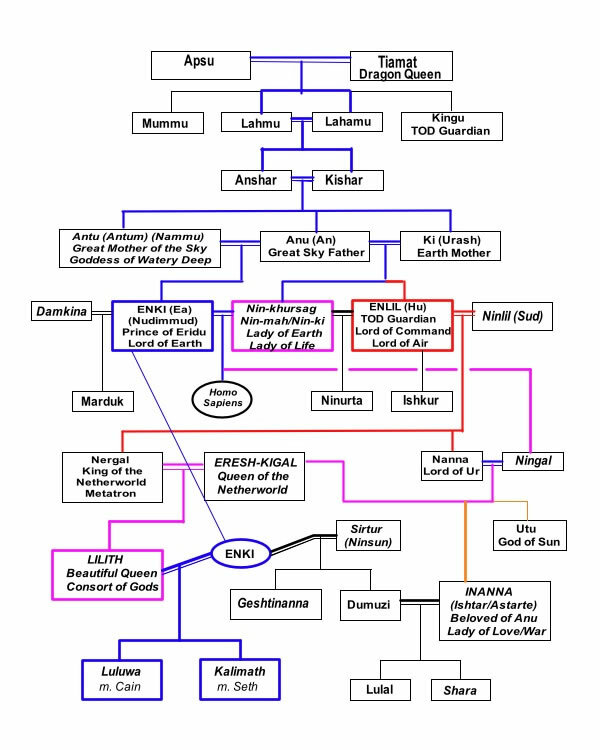 Lahmu and Lahamu, in turn, were the parents of the axis or pivot of the heavens (Anshar, from an = heaven, shar = axle or pivot) and the earth (Kishar); Anshar and Kishar were considered to meet on the horizon, becoming thereby, the parents of Anu and Ki. NOTE also that the abzu, from the Sumerian ab 'far' and zu 'water' was [also] the name for fresh water from underground aquifers that was given a religious quality in Sumerian and Akkadian mythology. Lakes, springs, rivers, wells, and other sources of fresh water were thought to draw their water from the abzu. Symbolically, Lahmu referred to the silt islands that appeared where the Fresh water (Abzu) met the Salt water (Tiamat) of the Persian Gulf. Some scholars have speculated that the name of Bethlehem actually originally contained a reference to a Canaanite form of Lahmu, rather than to the Canaanite word for "bread". From Wikipedia: Lahamu was the first-born daughter of Tiamat and Apsu in Akkadian mythology. With her brother Lahmu she is the mother of Anshar and Kishar, who were in turn parents of the first gods. Lahamu is sometimes seen as a serpent, and sometimes as a woman with a red sash and six curls on her head. It is suggested that the pair were represented by the silt of the sea-bed. From Wikipedia: In the Akkadian epic Enûma Elish, Kishar is the daughter of Lahmu and Lahamu, the first children of Tiamat and Apsu. She is the female principle, sister and wife of Anshar, the male principle, and the mother of Anu. Kishar represents the earth as a counterpart to Anshar, the sky, and can be seen as an earth mother goddess. Kishar appears only once in Enûma Elish, in the opening lines of the epic, and then disappears from the remainder of the action. The designation, Anunnaki, can be literally [or liberally] translated as “Those who from heaven to earth came”. (Anu = heaven; ki = earth) The term applies to all of the Sumerian “gods and goddesses” (as well as those other civilizations over which the Sumerian ruled, albeit with different names. For example, Inanna = Ishtar = Isis = Athena/Aphrodite/Artemis). This is really the name of the game here. The kingship and its royal line contains an essence different from commoners. As it turns out, Adam and Eve were created by combining the genetics of the Anunnaki (more accurately those of Enki) with that of the local population of early humans. Note that these "early humans" were wandering about the planet prior to Adam and/or Eve. Also, very importantly, Adam was intended to be the king, and due to his (allegedly) vastly superior and improved DNA, was divinely and practically superior to all of the other humans. This is ultimately the basis and in all respects, the reason for the otherwise irrational obsession with bloodlines, aristocracies, and the intentional avoidance of marrying outside one’s class. As stated in the quote above: "kings differ necessarily and in essence from other men." The kings were in fact divine... i.e., blue bloods with Anunnaki DNA... while all the red-blooded types were the working class with the genetic heritage of early humans only... or sometimes a smattering of blue blood genes gone temporarily astray. This explains why marrying within the royal family was so incredibly important for legitimacy of any king, however the king gained his throne Such marriage(s) allowed his children to obtain the right genetic makeup. And because one could never really be sure of which man conceived which offspring, but fairly certain if a particular woman had given birth to a particular child -- this factor became the reason the matriarchal line of succession was so vastly superior to the patriarchal line of succession in terms of deeming who was of the pure, royal blood (e.g., the Sangrael). In fact, in order for a king to be legitimized (no matter his genetic and genealogical credentials), inevitably he had to marry the right queen. In this respect, kings could be said to have “married up” (in terms of the hierarchy). Otherwise no one could be certain of his descendants’ birthrights... and thus potentially said king (no matter how he got there) would no longer be ruling by divine right. Again, a fundamental premise in these genealogies is: The distinction between the Descendants of Eve (and to a lesser extent, Adam), as well as from Enki, the Anunnaki, and the gods and goddesses... and those descendants of the “beclouded people” (i.e., those without the Anunnaki bloodline)... is incredibly important. In fact, one can say that the description of “beclouded” is just about as appropriate as can otherwise be imagined. More on the Adam/Eve royal status is provided below in The Adam’s Family (MOAFT). In the interim, the suggestion of the Anunnaki being somehow fully enlightened beings is probably a bit of a stretch. They may be light years ahead of the “beclouded people”, but even perhaps more than a few of the latter may be able to detect some truly dysfunctional characteristics among their overlords. For example, “a longstanding puzzle which has loomed in the face of all biblical researchers is God’s distinctly split personality. One minute he is the gentle shepherd calling his loyal sheep -- emphasis on the word, sheep -- to his side; the next minute he is launching fire and brimstone upon his own supporters. The descriptions of Tiamat, and the next two generations strongly suggest a more symbolic nature of these ancestors... while by the time of Anu and his offspring, the stories are suddenly much more believable... and/or potentially real. Certain specific characteristics and motives may be described in the myths as those of Tiamat, et al, but it is only when one reaches the level of Anu does one recognize the activities and stories of real, living, flesh and blood creatures... or previously living in some cases. It may not make an enormous amount of difference how we view Tiamat or, say, Kishar -- as real or simply a mythological. Kishar, for example, often associated with the planet Saturn may have created life on earth via some sort of seed dissemination from Iapetus. The latter is decidedly speculative, but it may illustrate in myth format the seeds of truth [pardon the pun] on just exactly what happened at various times in the geological record of earth. Perhaps the Cambrian Explosion, for example, was initiated by an extra-terrestrial source. Everything is thus a bit of symbolism... and the names and characters of the main actors may contain a bit of fantasy. Anu, et al, on the other hand, have all the earmarks of being quite real. We will accordingly make the assumption herein that at least from Anu on down, the gods and goddesses are very real indeed. Not to take anything away from Tiamat, but the consistent references to the sea... does appear to acknowledge the sea as the birthplace of life. Where else but the ocean/sea would one find a medium to create beings who are primarily water... where relationships can foster all sorts of new life, where singles bars can proliferate, where he or she can meet she or he, and where deadbeat dads can slip into the oblivion of the deeper and more foreboding depths? Anu, on the other hand, is just a guy wielding a big 'invincible spear".